Wallace Studios: When I was young a wise man told me "With Technique comes speed." When I was young a wise man told me "With Technique comes speed." It's been a year since I started my journey to become a better artist. In doing so I have also become a student of logic and invention. 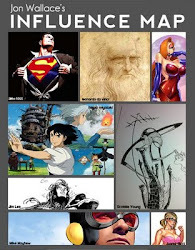 In my studies I have looked at Hogarth, Loomis, Frazetta, Leyendecker all of these artist have different styles and trigger a constant recurring emotion for each of their pieces. That being said, I have tried to copy their styles to add to my own. Caught up in books and wrapped around theories my own style has emerged. Im kind of excited but I feel I have to treat this new found discovery as an infant child. It's taken me a year to begin and now my journey has truly began. For those of you that know me, you know I enjoy Asian cinema. One of my favorite directors/ actors are Stephen Chow. His movies are action packed and funny. I've noticed an obvious subject with all of his movies, applying Shaolin to everyday life. All my art From here on out are based on theories that I hope to add to my artistic study and process. I know it's a strange leap but if I can find a way to apply this to my art style. I think It will become beautiful and effective.